His birth name was William Claude Dukenfield, and he was originally slated to play the Wizard in The Wizard Of Oz. He either rejected it because the part was too small (that’s what she said) or the price wasn’t of his liking. Fields was one of the most original performers, in appearance and voice. W.C. was one of those people that everyone was convinced they could imitate well, and SO couldn’t. Ed McMahon pretty much defines this. W.C. loved the bottle, and his health suffered because of it. 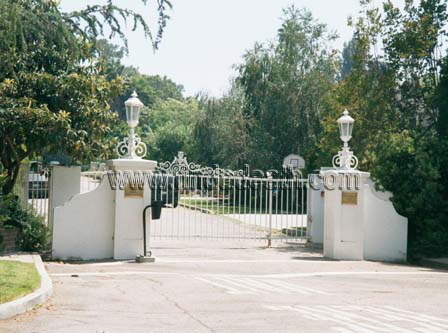 He lived in a section of LA now called Laughlin Park, very near Griffith Park. Legend has it that Fields would keep a rifle handy, in case any wildlife might wander out of the nearby park or zoo. Not a ridiculous thought, coyotes are seen skulking about that area often. 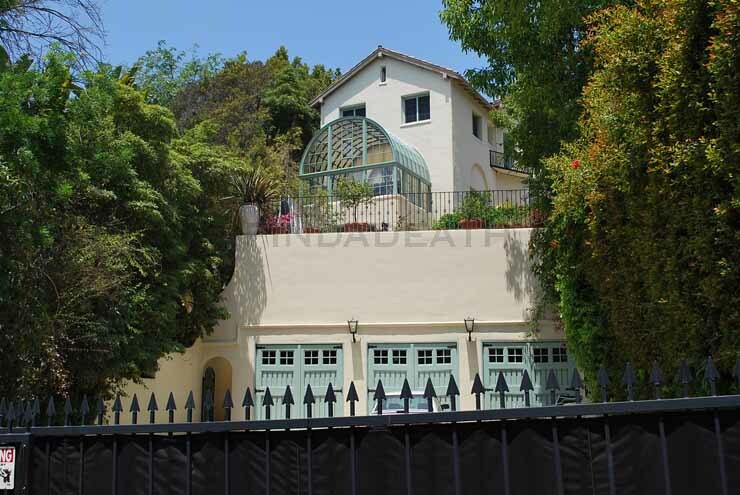 Also, this is the house where Lily Tomlin lived from 1981 to 1999. Can’t see the front of the house, but you can see the garage. Here’s a funny: If you go up to the Observatory in Griffith Park, to the back stairs where those telescope things are, you can put fifty cents in and see the house quite clearly. Interesting factoid, Fields never owned this home, or any property. He preferred to keep his money in cash, in banks. The people that did own the house – would occasionally find cigar butts tucked away in odd corners of the basement. The house has been modified considerably. 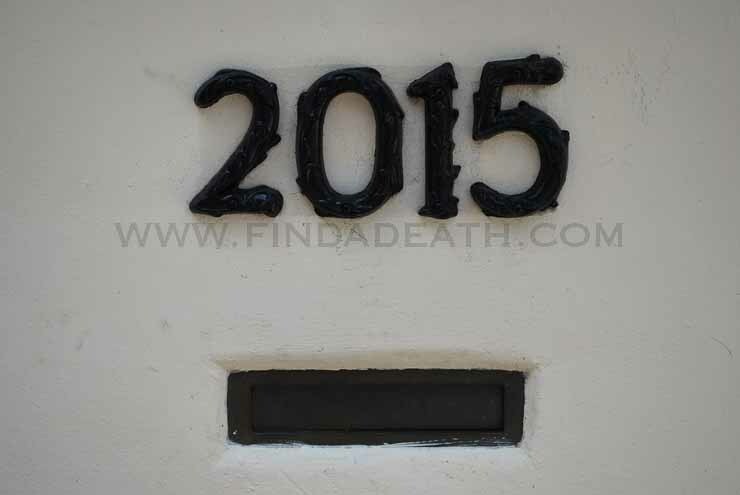 In May of 2009 my pal Vendreti got us an invite to the home next door to the Fields house. I was finally able to see the home. An interesting slice of Hollywood history happened there. Across the road from Fields, lived Cecil B. DeMille. 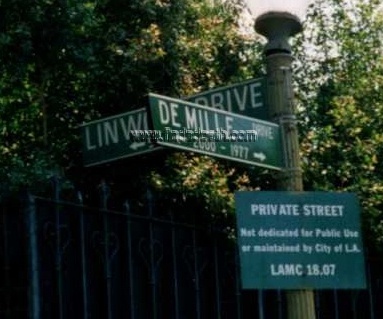 The street they lived on was Demille Drive. I mean seriously, what are the odds? 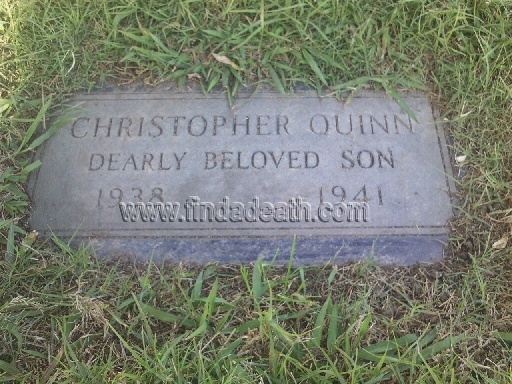 DeMille’s daughter Katherine was married to actor Anthony Quinn. On March 15th, 1941, their little 2-year-old son Christopher wandered on to W.C. Fields property and drowned. EJ Fleming clarifies: Fields had a large circular fountain in front of the house (beneath the stairs off the front porch that you can see in your photo). Fields used to leave model boats floating in the fountain – he collected them – and the kid went into the fountain to get one of the boats. That’s how he drowned. The story goes that Fields took the boats and burned them and had the fountain torn out and filled in the hole. W.C. was mortified and devastated, especially because of his reputation for hating children. Legend has it, he had the pool filled in. 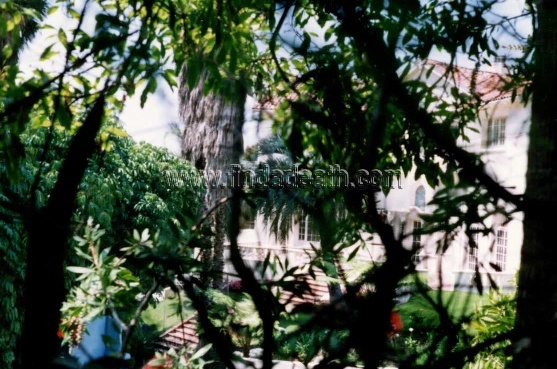 If that’s true, Lily must have had it unfilled, because if you look closely through these shrubs, you can see it. 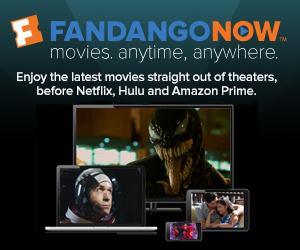 EJ Fleming confirms – the pool would have been added later. In early 1946, the effects of cirrhosis were becoming more evident. His abdomen began to swell and fill with water, distending his stomach. He was losing strength in his arms and legs and his kidneys were not functioning well. He announced he wasn’t renewing the lease on the house and sold his household possessions. 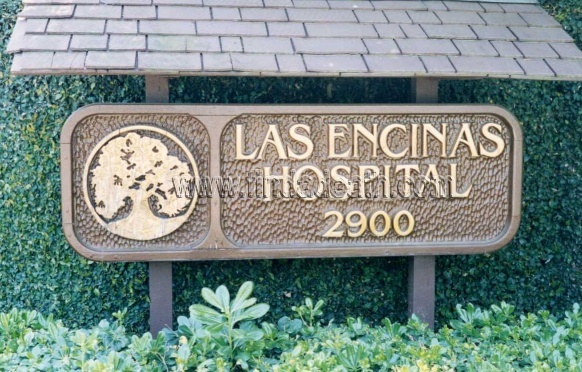 He was admitted to the Los Encinas Sanitarium where he had a private bungalow. According to his mistress Carlotta Monti, Fields’ last words were, “G*ddamn the whole friggin’ world and everyone in it but you, Carlotta.” In the same paragraph, Carlotta says he was 68 years old. mmhm. I’m sure that is exactly what he said. It was Christmas Day, 1946. He was 66 years old. His immediate cause of death was cirrhosis of the liver. Again according to Carlotta there were three funerals. One was non denominational, where Edgar Bergen gave the eulogy, “We are uninvited guests here, you know, because Hill didn’t want a religious funeral service. He said to me once, ‘If I ever found a church that didn’t believe in knocking all the other churches, I might consider joining it.”‘ There was a Catholic service for the Field’s family, in which Fields’ mistress was excluded. The last was done by Carlotta, said by the Reverend Mae Taylor. 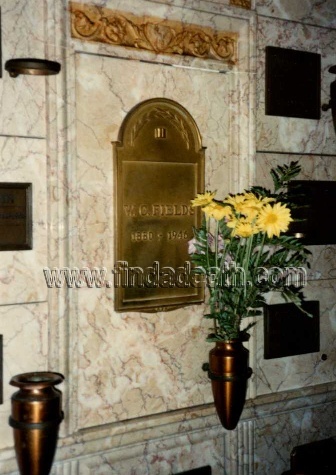 Fields was cremated and his ashes are interred in a niche in the Great Mausoleum in Forest Lawn, Glendale. Spitting distance from Michael Jackson. 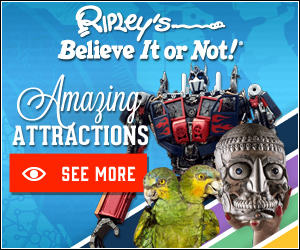 In fact, he probably does. Unfortunately, Fields did not mark his tombstone with, “I’d rather be in Philadelphia,” as he often said he would. 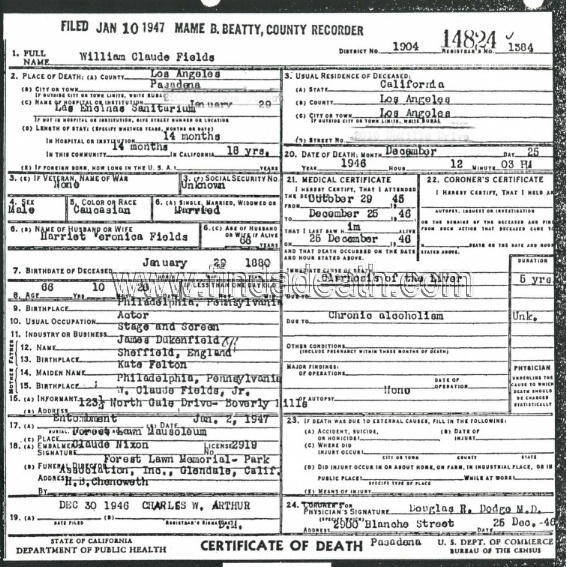 There were “issues” with the estate and Carlotta – mostly because Fields was still married and had a son. 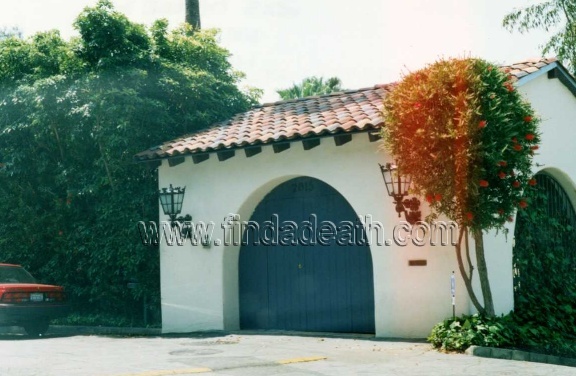 W.C. left a $770,000 estate behind. Carlotta won two trust funds that paid her about 50 bucks a week for ten years. 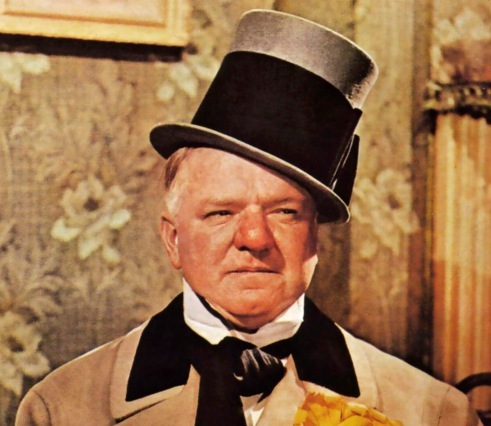 On Friday, January 29, 2010 – W.C. Fields would have turned 130 years old. The Magic Castle in Hollywood held a celebration to acknowledge the event. The Magic Castle has an amazing collection of Fields’ memorabilia – including Fields’ very own pool table vaudeville on which he would perform tricks. Attending was writer Lisa Burks, who sends us a great recap of this magical evening at the Castle. Thank you, Lisa and Walter. Fields appears in the top row on the Sgt. 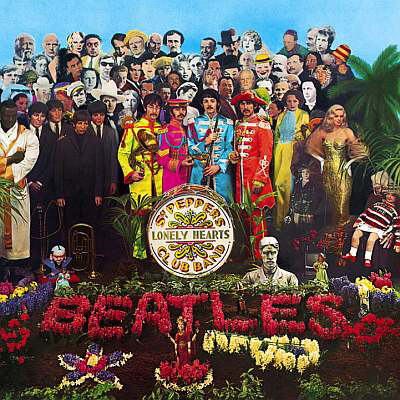 Pepper album cover. More: Remember when Fritos used a cartoon W.C. Fields (W.C. Fritos) as their spokesperson? 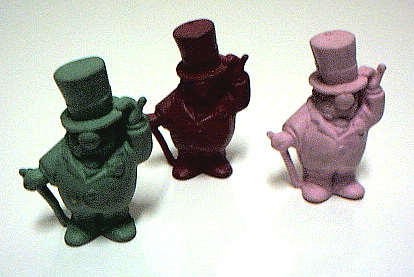 Plus, they made delicious erasers. Some of the information on this page was collected from the book W.C. Fields and Me – by Carlotta Monti, billed as “The Woman Who Lived With Him For 14 Years.” Anyone can call bullsh*t but any way you look at it, she was there.